Do you remember your first rose? Was it part of a white bouquet for your First Communion? A pink wrist corsage for a school dance? Or maybe a single red rose from your fiance? I saved rose petals from bouquets my boyfriend gave me, and eventually used them as part of the stuffing in our ring-bearer pillow. For Lucy Sullivan, a long-stemmed red rose with her grandmother’s rosary wrapped around it was part of No Ordinary Day. And now you can enter to win a rose from Polly Becks. 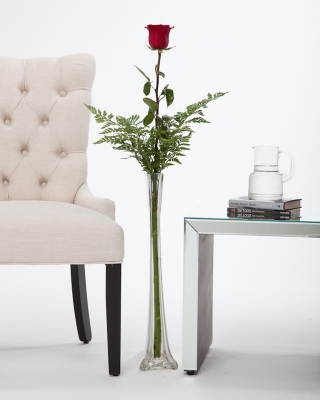 Lucy’s red rose is three and a half feet tall, and comes complete with a pretty glass vase, delivered right to your door. Wouldn’t it look lovely in your house? My contest runs until September 30, 2015, and is open to residents of the United States only (due to shipping restrictions). Enter to win a rose from Polly Becks and good luck!